We introduce captcha, an automated test that humans can pass, but current computer programs can’t pass: any program that has high success over a captcha can be used to solve an unsolved Artificial Intelligence (AI) problem. We provide several novel constructions of captchas. Since captchas have many applications in practical security, our approach introduces a new class of hard problems that can be exploited for security purposes. Much like research in cryptography has had a positive impact on algorithms for factoring and discrete log, we hope that the use of hard AI problems for security purposes allows us to advance the field of Artificial Intelligence. We introduce two families of AI problems that can be used to construct captchas and we show that solutions to such problems can be used for steganographic communication. CAPTCHAs based on these AI problem families, then, imply a win-win situation: either the problems remain unsolved and there is a way to differentiate humans from computers, or the problems are solved and there is a way to communicate covertly on some channels. Luis von Ahn, Manuel Blum, Nicholas J. Hopper and John Langford. The CAPTCHA Web Page: http://www.captcha.net. 2000. Greg Mori and Jitendra Malik. Breaking a Visual CAPTCHA. Unpublished Manuscript, 2002. Available electronically: http://www.cs.berkeley.edu/~mori/gimpy/gimpy.pdf. Moni Naor. Verification of a human in the loop or Identification via the Turing Test. Unpublished Manuscript, 1997. Available electronically: http://www.wisdom.weizmann.ac.il/~naor/PAPERS/human.ps. Adi Shamir and Eran Tromer. Factoring Large Numbers with the TWIRL Device. Unpublished Manuscript, 2003. 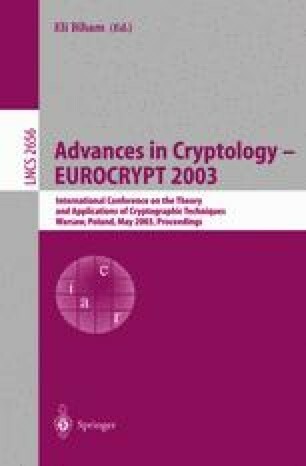 Available electronically: http://www.cryptome.org/twirl.ps.gz.